What are you studying and what are your professional goals? I am a Dramatic Literature major with a minor in Business of Entertainment, Media, and Technology (BEMT) through Stern, Tisch, and Steinhardt. I learned about the BEMT program through the CAS cohort program. I want to direct theater. I have been doing theater since elementary school, both on stage and backstage. I just had the opportunity to assistant direct “From up Here,” the CAS Theater spring production. It was written by NYU alumna Liz Flahive (Tisch ’02). I also co-founded a student club this year, Broke People Theater, with some of my classmates. We had our first festival in the fall and our second festival this spring. Next semester, we are planning to expand to three events. I am building a professional website for my capstone project and Jill has been giving me her input, as a director. She advised me to include a full production history and a resume, as well as photo content. 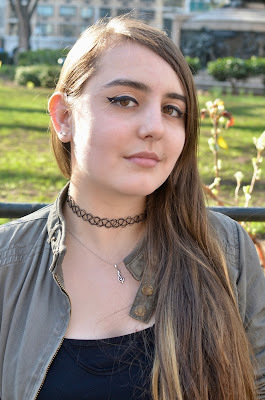 I am excited to get involved in professional theater in New York, and she encouraged me to direct a fringe festival play before I graduate, if possible. Since she has prior experience directing in fringe festivals, she was able to give me specific advice.